CloudBuckit is a complete desktop utility that connects and manages your FTP and webDAV servers as well as cloud resources at one place. The program allows users to manage stored cloud content, perform backups, share and transfer data, synchronize and migrate files, etc. With this file transfer application, users can easily access an array of cloud storage services such as Google Drive, MEGA, Dropbox, and OneDrive from a single interface. 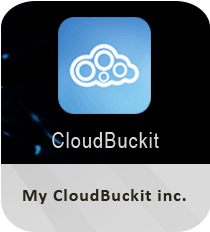 You can add as many cloud storages to your CloudBuckit account as you like. Once you add your clouds, you can access them right from the start page. Apart from uploading and downloading files, the online storage service allows you to copy or move files between local devices and any of your cloud storages. It also helps you create public links to your files. You can even share these links on social networking sites, including Weibo and VK. Download CloudBuckit to manage multiple FTP servers and cloud storage services right from your desktop. The cloud manager allows you to schedule migrations, backups and synchronizations of your files according to your needs. The software enables you to add any file as favorite and displays a list of your favorite files from all storages. The latest version of CloudBuckit for Windows features cloud drive mapping that maps your cloud storages as a drive. You can quickly access your files by dragging and dropping them from local devices or other mapped storage devices. The free multi-cloud managing app helps you access all your cloud storage services as well as FTP servers right from your system. CloudBuckit allows you to work with your online files as easy as you do it everyday in your local PC. If you are looking for a highly secure and easy-to-use cloud storage manager, CloudBuckit is just the right choice.